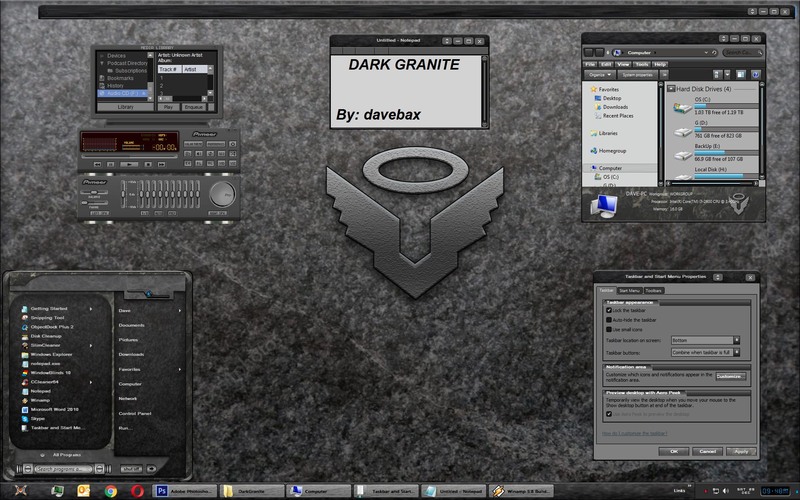 DarkGranite. Windows 7/8/10. Please enjoy this WindowBlind and thank you all for the years of support you have given me.As always user pick included but you will have to make a small change to see it. Instructions included. Really cool DB. Ten for this. Thank you Mike and Ross. Truely appreciated. Fantastic skin Dave! Looks great! nice and clean, good job Dave. HEY............ I have this on my screen!! Don, Tom, Greg, Sed, Jim. Can't thank you enough for the nice wird. Appreciate all of them. Wallpaper - Open Windowblinds. Left side click on Wallpaper. Locate wall and double click on it. It's now on your desktop. Bravo Dave, you have done a very beautiful work!!! Vraiment ,merci pour ce beau skin . Nikos. Appreciate your thought always. hayastani15, thank you and sorry for using youe screen anme but don't know your actual name.